Quinoa, pronounced KEEN-wah, is a psuedocereal, a grain-like crop. Quinoa is the seed of the goosefoot plant. A psuedocereal is not a true grain, but is still easily ground into flour. The protein content is very high, and Quinoa has all the amino acids that our body needs, making it a complete protein source. If your trying to increase the nutrient content of your meals, Quinoa is an excellent way to do it. It tastes great, too! 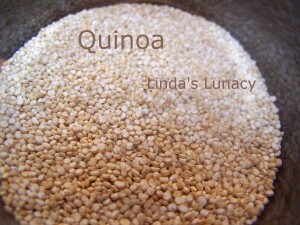 Quinoa is usually used as one would use a grain like wheat or oats. It’s as easy to cook as rice. However, Quinoa actually is from the same family as spinach, swiss chard and beets. Quinoa can also be ground into a flour and is used in gluten free baking. My kids like Quinoa for the most part. Some will it it plain, some prefer it served with a sauce. While I do like it plain, serving it with Chicken Parmesan is my favorite way. So far, I haven’t served it as our only protein source at a meal. I don’t think my meat eater husband would appreciate that very much. lol I have gotten him to the point where he will eat a bean based meal once a week, though. Sometimes twice a week. I did try one recipe last summer that I did not like. I tried a Quinoa Tabouleh recipe off the package. I thought it sounded good, and I had a lot of fresh peppermint in my herb garden. I have never had Tabouleh before, and I should have known from reading the recipe that the flavors would be strong. I, the Quinoa lover of the family, couldn’t even eat it. I will try it another time, but I will cut the lemon juice and peppermint down drastically, than increase to taste. Quinoa is a tasty, nutritious addition to our menu. Have you ever tried Quinoa? Wow, I didn’t know it had alot of protein in it, or that it comes from the spinach family! I never tried it, but now I want to! I love quinoa! It can be pricey though so I haven’t buckled down and purchased the huge amount from Costco yet. I need some additional recipes. Do you use it similar to maybe rice in your dishes? Thanks for linking up to Healthy Tuesdays Blog Hop. Kerry recently posted..First Giveaway of 2013! I usually serve it by itself or with a sauce, I haven’t tried it in a dish as a replacement for rice. I have been adding quinoa to our meal plan more often. I found some on sale at our grocery store, so I have quite a bit. Thanks for sharing! I love quinoa! I haven’t been cooking it as regularly as I was but I have a great salad type recipe. Still messing with the seasonings but those could always be to taste. I did know it was a complete protein, have used it as a meat replacement in my meals but not the family’s, didn’t know it was from the spinach family. Thanks for the recipe ideas! What a great post! Lots of great info about Quinoa. Thanks!